Congress gave final approval for a national World War II Memorial in the heart of the Mall yesterday, ratifying plans to commemorate the central conflict of the 20th century with a wide plaza of granite columns and arches between the Washington Monument and Lincoln Memorial. By a voice vote, the House of Representatives abruptly ended a long controversy over the scale and location of the seven-acre, $160 million project and ordered construction to proceed, nullifying both a court challenge and a federal commission’s plans for more hearings next month. With the Senate having passed the same measure Monday night, the bill goes to President Bush, whose spokesman said yesterday that the president will sign it. The White House is contemplating a Memorial Day signing ceremony. The back-to-back votes settled an emotional debate that pitted veterans groups, seeking a grand tribute to the 16.4 million U.S. servicemen and women who won victory in Europe and the Pacific, against guardians of the Mall, who said the project’s site and design would permanently scar the wide-open vistas of the nation’s greatest civic space. The votes also delivered a reminder that when it comes to memorializing history in the District, Congress remains the final arbiter. 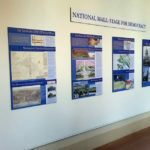 Impatient with a process that had involved 22 public hearings and a half-dozen federal and local agencies, the House and Senate, without a hearing in either chamber, passed a measure declaring that approval of the project is final and immune to legal challenge. City and federal planners were already searching through the acrimony for lessons on how to avoid a political donnybrook the next time a memorial is proposed. And they were bracing for a 30-month construction period that will turn the core of monumental Washington into a hard-hat zone for tourists and downtown commuters alike before the World War II memorial opens in 2004. Opponents of the project lamented the decision to eliminate one of the large green swaths for which the capital city is famous. The World War II Memorial will be the last of a trio of monuments to wars of the last century built near the Mall’s centerline, following the 1982 dedication of the Vietnam Veterans Memorial and the 1995 dedication of the Korean War Veterans Memorial. Rhode Island architect Friedrich St. Florian submitted the winning design among 404 entries in 1996. His original plan was dominated by a sunken granite plaza the size of a football field, ringed with broken columns and backed by a solid wall, earthen berms and a museum. Plans also call for an access road off 17th Street, a 3,000-square-foot information pavilion and 1,500-square-foot comfort station. Federal planners expect that 3.5 million people will visit the memorial each year, including 600,000 in each of the peak spring months. Yesterday, project sponsors and federal regulators cautioned that construction of a major memorial in the middle of one of the capital’s most scenic destinations will not be easy or fast. Litigation filed by opponents last fall forced the American Battle Monuments Commission, the memorial’s sponsor, to stop all construction activity before it had selected a general contractor. Commission spokesman Mike Conley said yesterday he believed that excavation could begin by July. But the National Park Service warned of a six-month delay in the excavation work, saying that the lawsuit blocked the April pruning of roots belonging to nearly century-old elms that tower over the site. The roots cannot be trimmed until December without harming the trees, said John Parsons, the Park Service’s associate regional director. Once construction gets underway, motorists will face occasional road closures and lane reductions on 17th Street. “If we have to shut down, it will be for brief periods only,” Conley said. Then there are tourists’ needs. The Interior Department in January required that work be done from 8 a.m. to 5 p.m. on weekdays only, halting from June 24 to July 8 to accommodate the setting up and dismantling of the Independence Day fireworks show. Engineers have designed an underground concrete wall to encircle the memorial down to bedrock to prevent it from draining water from underneath the Washington Monument and potentially tipping the obelisk. Environmental consultants also say runoff may be treated to reduce arsenic and other contaminants to acceptable levels before they reach the Tidal Basin. The fight over the memorial showed how difficult it is to insulate such projects from political pressures. Critics of the last-minute House and Senate intervention said the lawmakers were ignoring the system that Congress itself created in 1986 in an attempt to make the process less political. That year, in an effort to avoid a repeat of the controversy over the design of the Vietnam Veterans Memorial, Congress passed the Commemorative Works Act, giving three federal commissions oversight of memorial proposals. “Congress is acting inconsistently, clearly,” D.C. shadow senator Paul Strauss (D) said yesterday. “This is not a good day for fans of architectural integrity or the review process.” In January, the three commissions: the National Capital Planning Commission, Fine Arts Commission and National Capital Memorial Commission, agreed not to approve any new memorials in the “central axis” of the Mall, after grandfathering in the World War II Memorial and a still-unfunded Black Patriots Memorial. 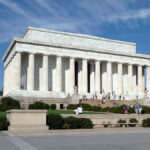 The agencies also released a draft master plan that identified 100 future sites for museums and memorials in Washington, all away from the Mall. Congress has yet to approve that plan, however.